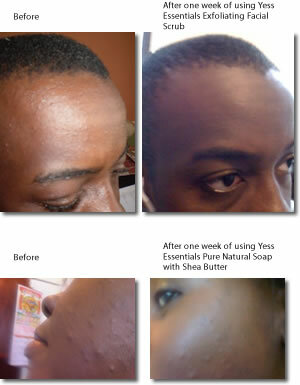 “I was pleasantly surprised when I first tried Yess Essentials Facial Cream and Scrub. In all honesty, I love the facial cream and found it to be very smooth and soothing. I particularly like the smell and I can’t wait for Yess Essential to produce more products. My daughter who is a teenager used the scrub and within a week her spot cleared. Well done for supplying the world with such awesome products. The Facial Scrub was amazing. It lathers beautifully and leaves my face smooth and soft. I highly recommend these products. I can’t get enough of them. Extremely softening of my very dried hands. Thank you for sending me a sample of the African Black Soap. It’s so wonderful for my skin. I have also purchased the facial scrub and cream from the store in Stratford. I must admit that your natural skin care products are beyond my expectation. My daughter and I started using your products four weeks ago and our skin has become radiant, silky, smooth and flawless. I have even stopped using foundation on my skin so that my natural glow can shine through. Do you remember you told me that you have no use for a foundation; now I see why. I have been searching for years to find natural facial products like yours. Thank you for coming across my life path with your secret of healthy, beautiful skin. Bless you and your family. I wish you eternal happiness, health and wealth. I found the Exfoliating Facial Scrub very effective and not abrasive. My face was slightly smoother than usual. The Nourishing Facial Cream was quite moisturising and left my face silky and soft. I congratulate you on the successful launch of these fantastic products. I must confess that I was quite sceptical about trying these products as in the past when I have used products made from black soap they have made my skin and my hands feel dry. You also end up needing to wash the bath as soon as you have stepped out because of the soap scum it leaves behind, but that is not the case with your products. I have also resigned myself to using Neutrogena face wash twice a week, but having tried your facial scrub I think I have found the right product for me. It makes my skin feel soft, my face no longer feels dry, and the soap doesn’t leave the bath looking dirty afterwards. The body creams are also very long lasting; I can go the whole day without my skin looking flaky. Thank you for these wonderful soaps and lotions and I wish you all the best. I have used this soap and find the smell appealing. It has a mild scent & a wonderful creamy lather. My skin feels fresh after I have used it. Before l had some spots at the back of my head and on my cheek. I used the facial scrub for 4 days, these spots were reducing especially the ones on my cheek. Fantastic. It felt so natural & nourishing. My skin felt great. My favourite is the facial scrub. I think l will purchase online in the future. I am a sensitive skin type and can only use small no. of products and l always go for natural products. Yess Facial Scrub cleaned brilliantly. It didn’t dry my skin. It left my face soft and feeling really clean. Thank you, l will definitely try the other products but need to go slow because of my sensitive skin. I liked the products very much. They have a fresh scent that stays for a while. The facial cream is light and non-greasy and leaves the skin silky and smooth. Both the Facial Scrub and the Facial Cream are very effective and good. The facial scrub is a good shaving material. If it used as a shaving cream, it is the best stuff l have ever used in terms of bumps. Both of them used together are good facial products. The three products are fantastic. Having just been through chemotherapy, my skin was blemished and dry. I started using the products and within a week, the difference in my skin was remarkable. The nurses in the hospital commented on my skin and now l don’t think l will ever use any other product. It does not bleach and it leaves my skin soft and fresh. Fantastic. It felt so natural and nourishing. My skin felt great. My favourite is the facial scrub.